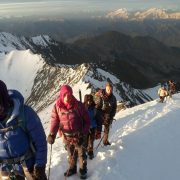 This 11 to 12 days trek is one of the most adventure. 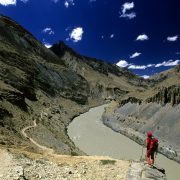 From Zanskar Valley to the indus Valley it crosses three passes each over 5000m high. The foot trail terminates at Hemis Gompa which is on the bus route from Leh. As this trail is un-frequented and without any habitation for most of the part, a local guide is very essential. The trail passes through deep canyons and crosses barren and rugged mountains. Only expeienced trekkers should venture on it. This is an easy trek of 7 to 8 hours. The trail Padum crosses a bridge over Tsarap Lingti River and going N-E reaches the Stongde village. A monastery peers at Stongde from above. For the trek to this side of the valley, this is the place to hire mules. From Stongd(also called Thonde) the tail passes through Tsazar and reaches zangla. In 19th century when Padum and Zangla was attacked by Zorawar Sing,the king of Zangla reached a compromise with the general and thus he was able to continue his rule around Zangla. The present king lives in Zangla. It is approximately 4 hours trek and the camping ground is some 8 kilometer from Zangla. 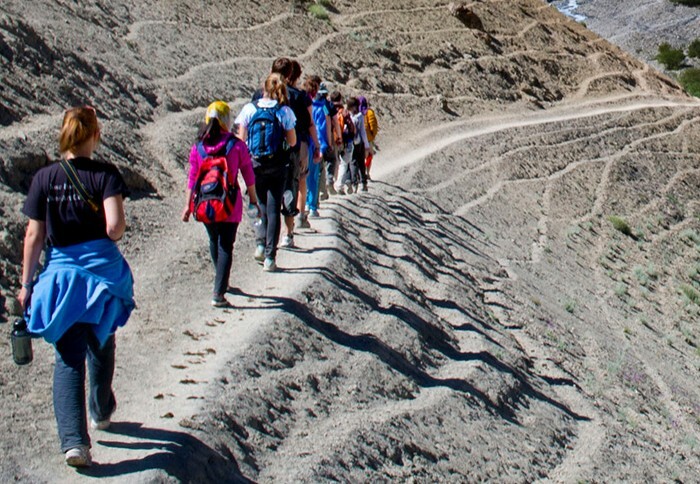 The trail assends steeply up to Zangla Gonpa and then enter a narrow river gorge. The river has to crossed and recrossed many times while walking through the gorge. The valley open out after 5 km.where two stream meet.from there a side trail branches off south-east to Ningri La. The main trail continues and truns north to Sumdho camping ground situated at the foot of charchar La,also called shirshir La. A 5 to 6 hours strenuous climb leads up to the pass. The trail heads west for some distance before turning north. The trail acrosses Zumlung stream many times and the route is full of boulders and stones. It is very steep near the pass. From the top of the trail descends N-E to Tom Tokh. As the trail beyound tom Tokh again croses and recroses the stream a numbers of times,it`s advised to start the trek early in the morning when the water level is not very high. The trail descend to a gorge and after a 4 to 5 hours walk reaches Shang kongma camping ground. 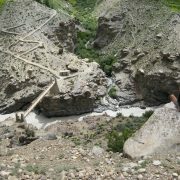 Walking along the stream for two hours as far as Tilat Sumdho,where the stream coming coming from CharcharLa meets Khurna river,the path truns SE and climbs along the Khurna river to reach Khurna Sumdho. From there it truns left,and after passing trough the narrow gorge,continues for 8 km as far as the camping grounds of Rubarung at the base camp of Rubarung La. It is a long trek of 9 to 10 hours from Shang kongma. About 7 hours are needed to reach Markha. For the first two hours the trail ascends to the pass then descend to meet Charcham Chu. After another hour the confluence of Charchum Chu and Markha river is reached. Markha village is situated 2 km downstream. 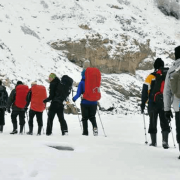 This 4 days trek is the same as discribed in Stok-Himis trek. From Khurna Sumdo there is another trail leading to Hemis Gompa via Zalung La(5198m). This trail climbs up to the Rubarung Camping ground and then turns to its right. The mountain ridge is crossed through a narrow gap which leads to Zalung La. From there it descends sharply to the Luntung Chu and reaches the camping grounds of Tahungtse, near Hankar. 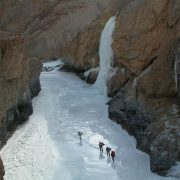 After that the route is the same as described in Stok-Hemis trek No.1, but in reverse. From Khurna Sumdo another trail branches south at Lapurba and after crossing two passes reaches Pume situated on the main Manali-Leh route. The trail from khuma Sumdo follows Lalung Topko to the SW, crosses over Shapodak La(5335m) and meets Niri Chu near Niri Sumdo. From here it turns south along Niri Chu, crosses Gautang La(4814m) and reaches Pkuktal Gompa. From here to Purne is an easy walk of 2 hours. Purne to Padum is an easy 2 to 3 days trek.